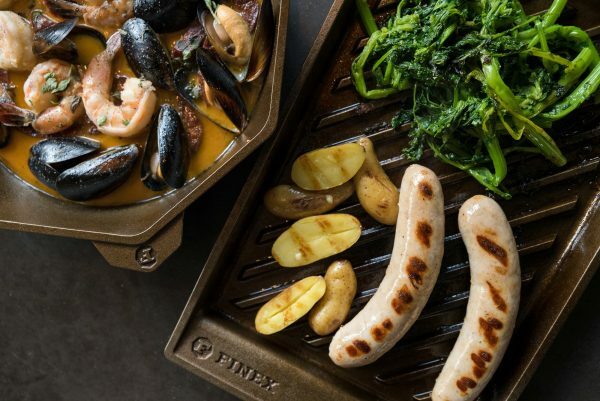 Grill Pan Bratwurst Recipe | FINEX Cast Iron Cookware Co.
Our Lean Grill Pan brings the sizzle to whatever you’re cooking and Olympia Provisions bratwurst is no exception. This recipe includes rapini & fingerling potatoes for a spring grilling twist on the traditional “meat & potatoes” motif. Recipe by Alex Yoder, chef at Olympia Provisions SE Portland location. Be sure to check out his seafood stew recipe as well. Combine the chicken stock, bay leaf, shallot, garlic, and parsley spring in a small saute pan and cook over medium high heat until reduced to ½ cup (about 30 minutes). Strain the sauce and discard the solids. Return the sauce to the pan and add the mustards. Stir to combine. Over medium heat, bring the sauce to a simmer and then add the butter. Stir continuously until the butter is melted and sauce has thickened just slightly. Remove from heat and season with salt and pepper to taste. Store in a warm place. Heat a Finex cast iron grill pan over medium heat. Once hot, add the olive oil and grill the bratwurst, rapini, and potatoes, turning as necessary to create grill marks and heat everything through (about 5 minutes). When the ingredients are almost heated fully, add the garlic and crushed chilies to the rapini. Stir to combine. 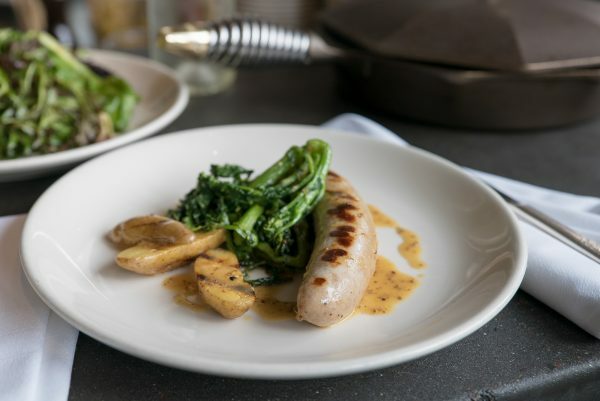 Divide the bratwurst, potatoes, and rapini evenly between four plates. Drizzle the grain mustard sauce over the sausage and potatoes.